With our new year’s resolutions already in place, it is always inspiring to hear of a story describing one person’s determination and resolve to accomplish their desired goals. 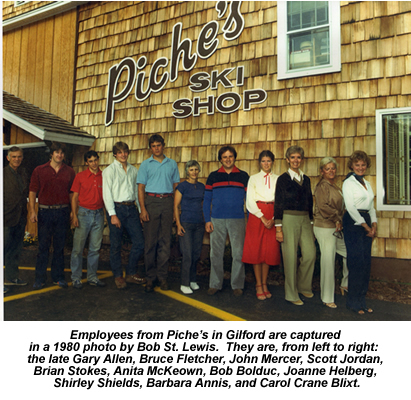 For 40 years, customers of Piche’s Ski and Sport Shop in Gilford have been greeted by the warm and friendly, Carol Crane Blixt. In times when a business might not last but a few years, it has become very rare for an employee to stay four decades at one establishment. A fact unknown to many, Piche’s actually began within the home of Francis Piche, the original owner of the store. Eventually the business was moved to its present location on Gilford Avenue; however, it was much smaller in size. With a grace that is possessed by so few, she worked seven days a week at three different jobs to make sure her children were fed and the mortgage was paid. “Back then, I worked seven days a week here at the store. I’ve always worked hard; I enjoy it. Mr. Piche was also a hard worker but a jovial, easy worker. We laughed a lot,” she commented. Her childhood was spent in New Jersey; her father being a successful businessman in New York City. She was able to graduate from high school and Fairleigh Dickson College before health reasons forced her father to move his family to New Hampshire so they could benefit from the slower pace of life. It brought about a major lifestyle change for the entire family, but without complaints, they made the best of it. She became a savvy businesswoman in her own right and has very successfully run her family’s cottages, Smith Home Cottages, which are located on the lake in Gilford. “My father built the cottages 60 years ago, and I’ve run them for 50 years. I was so fond of my father, and I feel that it is a way of preserving our little piece of Lake Winnipesaukee. One of the first things my father did when we moved here was to chisel the words, “Smith Home 1947” into one of the rocks at our home. I cherish the inscription on that rock,” she said. She decided long ago to commit to keeping the family-oriented, vacation cottages as close the original design as possible in order to preserve the history of the buildings. “Many of my renters return year after year because the cottages stay the same. I’ve made very few major changes to the cottages themselves, but I’ve maintained them quite well,” she remarked. In a world that feels that constant change is necessary, it is understandable why her renters return to experience something that truly does stay the same. If you have a family story or history that you would like to share with Gilford’s Thompson-Ames Historical Society, please contact us at: www.thomames@worldpath.net. Be sure to check our website at: www.gilfordhistoricalsociety.org for information about the Society and a listing of our upcoming events and programs.